Welcome aboard Dr Dumer. It is with great excitement we announce that Dr Natalie Dumer has joined our team. Dr Dumer migrated to Sydney, Australia with her family as a seven year old child from the former USSR. Dr Dumer has worked in orthodontics for 23 years, concentrating on Invisalign® as well as fixed orthodontics (braces), in a caring and gentle way, making her a wonderful clinician. 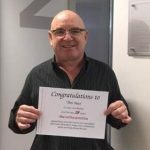 Would you believe Dr Baisi reached his 28th anniversary with TOP in April! Can’t believe it’s been so many years. 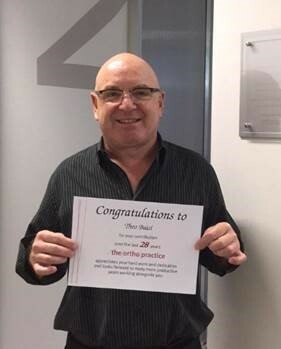 He counts himself lucky for loving his work, our team and most importantly, our patients. 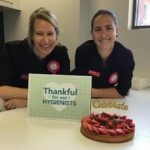 In April we celebrated our lovely hygienists Alanna and Larissa for Hygienist Day. Thank you both for all your dedication and hard work. 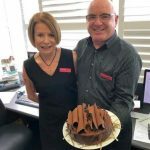 Theo and Railea celebrated their 25th wedding anniversary with a beautiful cake from the TOP team. On Friday 22 June, we held our first dentist information evening for 2018 at the Intercontinental Hotel, Double Bay. Many of our referring dentists and their teams attended. Dr Baisi gave a presentation at the event, on ‘Invisalign® Successful Treatment Outcomes in General Practice Part One‘. These events are very important to our practice as it is our way of thanking our dentists and their teams for their ongoing support. It is also a great chance for everyone to earn highly coveted CPD points, but also a great networking opportunity and social catch up. These events would not be possible without the help of our major event partners, Invisalign® Australia, 3M Unitek, SureSmile® and PresiDental®. Thank you for your continuous support. Look out for our Artwork of the Month competition – Kids, pick up an artwork form from your local TOP practice and see if you can draw the winning picture for the month. We are running this competition monthly at all 3 practices. There have been many warm, sunny days on the harbour of late. 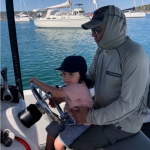 One Dr Baisi’s favourite days was teaching our manager’s son Louis (his protégé) how to sail and fish! He may be young but we think he’ll be chief skipper and swinging the rod out in no time! It’s been a busy few months as always, but we loved every minute of it. Thanks for stopping by our blog. We always like to hear feedback from our readers, so please feel free to comment below on some topics you’d be interested in learning more about.